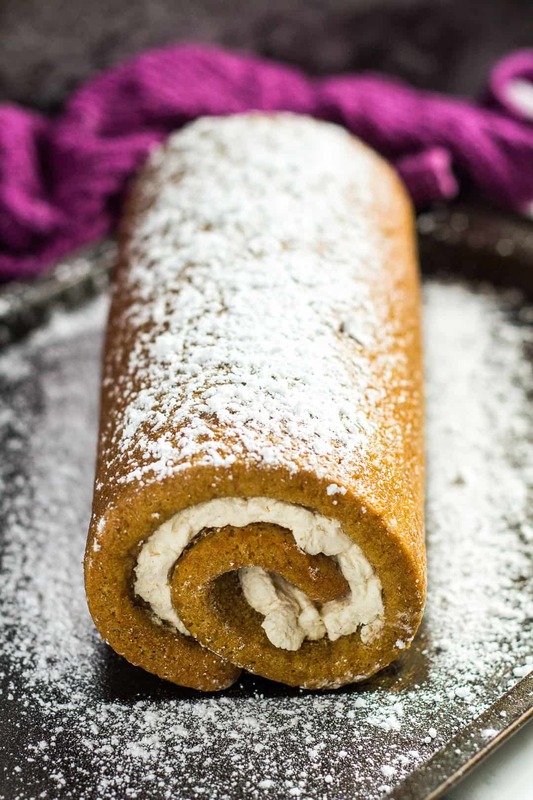 Gingerbread Cake Roll – Deliciously moist and fluffy gingerbread cake roll that is loaded with warm, cozy flavours, and filled with spiced whipped cream! I hope you have been enjoying my Gingerbread Cupcakes because today I bring you a new gingerbread recipe that is just as delicious, and even more fun to make! I bring you my Gingerbread Cake Roll! 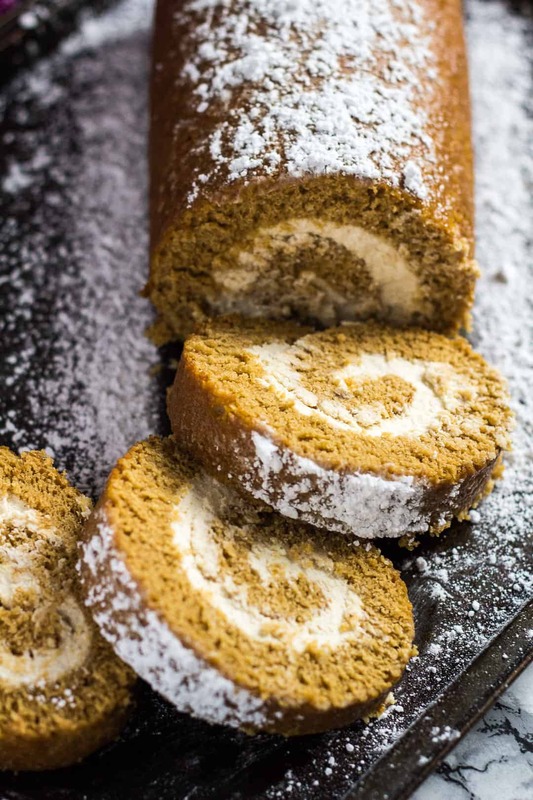 This cake roll is incredibly moist, so fluffy, and perfectly spiced with molasses, ginger, cinnamon, and nutmeg. Fill this cake with a thick layer of homemade spiced whipped cream, and you have yourself the perfect Christmas dessert. To make this cake roll, simply whisk the egg whites to stiff peaks, and set aside. In a separate bowl, whisk the egg yolks and sugar until light and thick. Mix in the vanilla, yogurt and molasses. Add the flour, baking powder, spices, and salt, and mix until combined. Gently fold in the whipped egg whites. Pour the batter into a greased 10×15-inch cake roll pan, and spread out evenly. Tap the pan lightly on top of the surface a few times to level out the batter. Bake for 8 – 10 minutes or until the cake springs back when lightly touched. Immediately invert the cake onto a tea towel generously coated with icing/powdered sugar. Leaving the parchment paper on, roll the cake up with the tea towel, starting at a short end. Allow to cool completely on a wire rack before filling. For the filling, whip the heavy cream until it starts to thicken. Add the icing sugar, vanilla, and spices, and whip to stiff peaks. Unroll the cake, gently peel off the paper, and spread the whipped cream evenly over the cake. Re-roll without the tea towel. Cover and refrigerate for at least 1 hour. Dust with icing sugar if desired before serving. How long will this cake roll last? This cake roll can be covered tightly and kept in the fridge for up to 3 days. 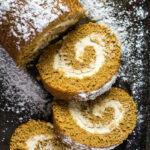 Can I freeze this gingerbread cake roll? Yes! This cake roll, with filling, freezes well for up to 2 – 3 months. Thaw overnight in the fridge before serving. Try these scrumptious cake rolls next! Deliciously moist and fluffy gingerbread cake roll that is loaded with warm, cozy flavours, and filled with homemade spiced whipped cream! Using a handheld or stand mixer fitted with the whisk attachment, whisk the egg whites until stiff peaks form. Set aside. In a separate bowl, beat the egg yolks and sugar until light and thick. Beat in the vanilla, yogurt and molasses. Add the flour, baking powder, spices, and salt, and mix until combined. Gently fold in the whipped egg whites. Using a handheld or stand mixer fitted with the whisk attachment, whip the heavy cream until it starts to thicken. Add the icing sugar, vanilla, and spices, and whip to stiff peaks. *Light or true molasses is much sweeter than blackstrap molasses (which is very bitter), and is much preferred in baking. Black treacle is also fine to use. **Make your own cake flour! Measure out 1 and 1/4 cups (156g) of plain/all-purpose flour, remove 2 tablespoons and replace with 2 tablespoons of cornflour/cornstarch. Sift well. OMG! I could probably eat this entire thing by myself! Lol! I love gingerbread! 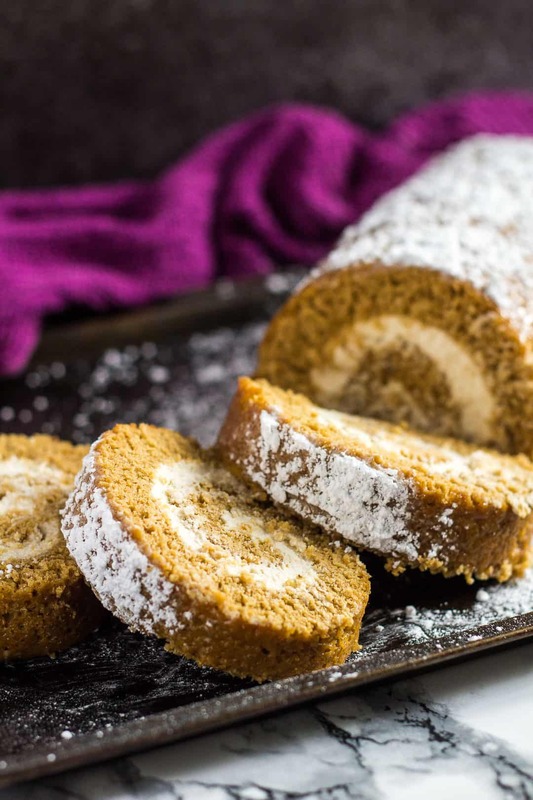 I absolutely love the idea of a gingerbread cake roll, Marsha! It looks scrumptious!!! Tongue is out of my mouth… Lake a classy lady! Wow, look at you! And I love your new logo/layout! I’ve been meaning to make a Christmas-themed cake roll and this looks fantastic. I’m drooling a bit, ssh. 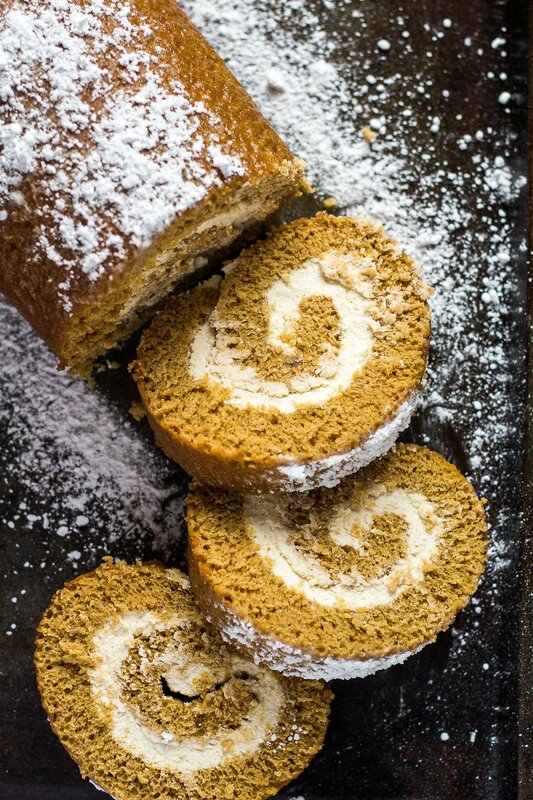 This gingerbread roll look absolutely divine Marsha. I bet those warm gingerbread spices make the whole house smell irresistible. This could be the excuse I need to try my hand at making a roll cake. What showstopping pictures Marsha, wow! I’ve never made a cake roll before, but pretty sure I have to now that gingerbread is involved! 😀 And spiced whipped cream? Talk about a heavenly combination with the gingerbread cake. Now I’m stuck trying to decide whether I should make this or your gingerbread cupcakes first, hehe, I love both recipes! One quick question though: I’ve never heard of a cake roll pan, do they differ significantly from regular cookie sheets? Yummy yummy! This is the perfect special treat to impress company with! Hi! I just made this and everything tastes great! Unfortunately, my cake turned out a bit rubbery. Do you think I folded the egg whites in too much? Any idea what I could do to fix it next time? Hi Erin! There are a few possibilities why a cake roll can become rubbery and dense. 1. Overbaked. Leaving the cake in the oven too long can cause this. Because it’s such a thin layer of cake, it doesn’t need long at all and it’s very easy to overbake. 3. Overmixing. Too much gluten development caused by too much mixing. 4. The most likely reason is the oven was too hot. If you don’t already, I recommend testing your oven with an oven thermometer to make sure it’s on the right temperature. the cake cracked a LOT – I have made a lot of roll cakes and never had one split in 3 pieces. it seemed thicker than other cakes and maybe that is why. I managed to roll it up anyway. It is not much to look at. I snuck one little bite and it seemed a little rubbery as mentioned above but still good and the flavor is very good. The whipped cream is amazing. So good! I am going to make more to garnish the cake when serving and to hide the cracks. I would make it again, but possibly try a larger pan. Sorry to hear your cake cracked! I’m sorry I can’t tell you what went wrong without being there, but I can give you a few tips. Firstly, be sure the cake batter is spread evenly in the pan. This will promote even baking and help your cake remain moist. A moist cake has less chance of cracking. I always tap my pan on the surface a few times to level out the batter, and pop any air bubbles too. Overbaking could also be the culprit for a cracked and rubbery cake. The thin layer of cake batter in the typical 15×10″ by 1″ baking pan takes only about 10 to 15 minutes to bake. Once done, the top of the cake should spring back when lightly touched. Remove the cake from the pan onto a towel as soon as you take it out of the oven. Rolling a HOT cake will help prevent cracking.